What did Jesus say about homosexuality? Or Hell? Or how we should engage the culture. 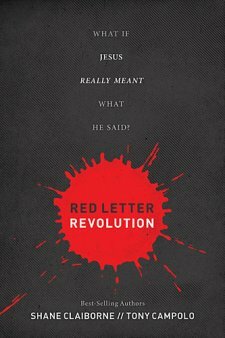 Shane Claiborne’s and Tony Campolo’s book Red Letter Revolution aims to answer those questions. Through it isn’t cut and dry like so many other books, Red Letter Revolution is akin to sitting in the room while two good friends discuss the importance of taking seriously the words of Jesus. They discuss theology, life, and the world in such a way that makes it easy to grasp, while at the same time their discussions encourage the reader to revisit those wonderful red letters that so often slip our minds on a daily basis. That isn’t to say this book isn’t challenging. It is. It is especially so if one considers their theology to be more influenced by their politics, as is the trend in the American church. So to say that Red Letter Revolution is challenging is an understatement, but it is absolutely a worthwhile read. While the subjects that Shane Claiborne and Tony Campolo tackle might not sit well with you, there is value in reading an opposing view. After all, when surrounded by the comforts of our conservatism, one does not often hear it said that “we need to be pro-life from the womb to the tomb.” As a theological conservative, I have to admit that is a very good question. I would encourage readers of all ages to give this book a try. We are never too old to grow or be challenged, and the generational gap between these two authors provides a unique stage for such an important dialogue. “we need to be pro-life from the womb to the tomb” is a great quote to single out. Also, the fact “We are never too old to grow or be challenged” is good to see in print. Nice debut review. It certainly serves up interest in this book.